This opinion will be unpublished and may not be cited except as provided by Minn. Stat. 480A.08, subd. 3 (2014). 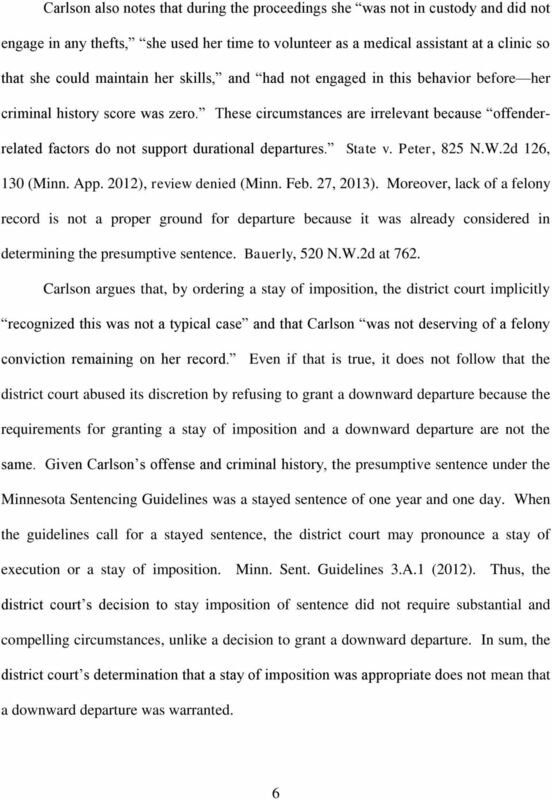 Download "This opinion will be unpublished and may not be cited except as provided by Minn. Stat. 480A.08, subd. 3 (2014)." 1 This opinion will be unpublished and may not be cited except as provided by Minn. Stat. 480A.08, subd. 3 (2014). 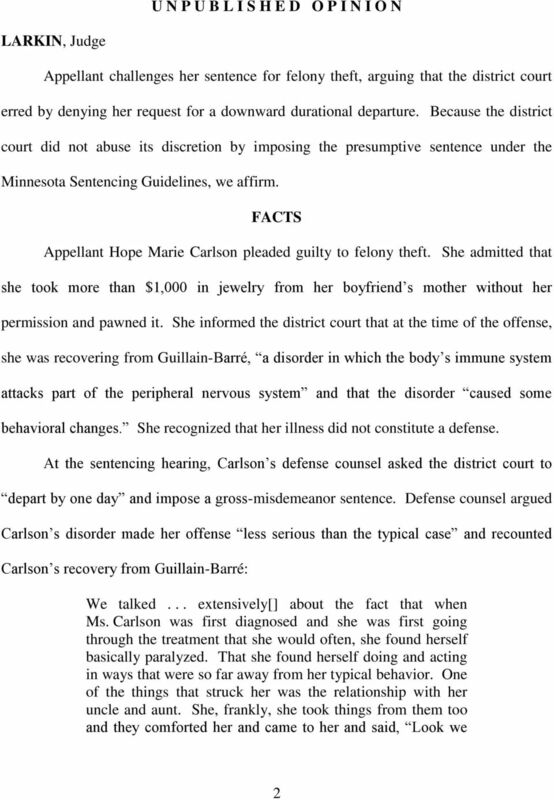 STATE OF MINNESOTA IN COURT OF APPEALS A State of Minnesota, Respondent, vs. Hope Marie Carlson, Appellant. 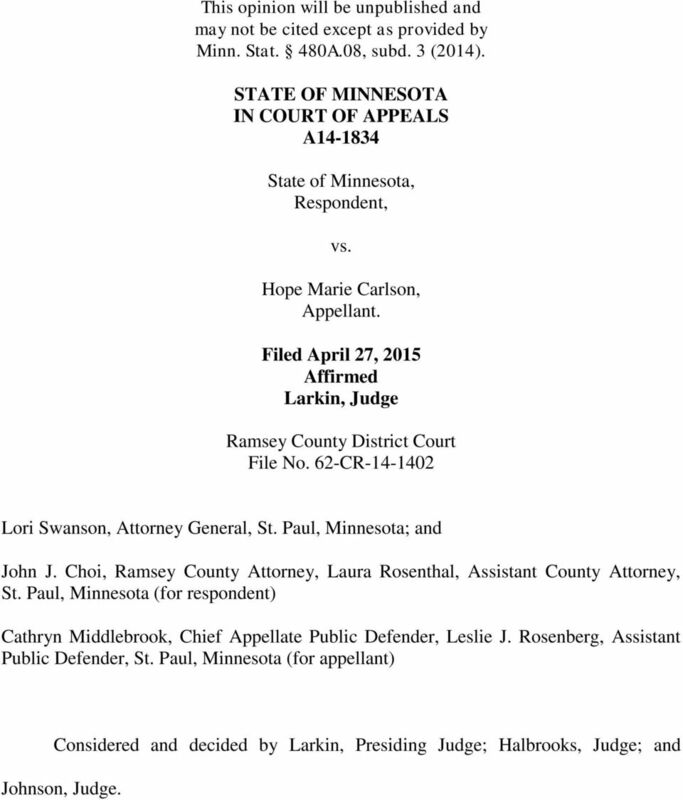 Filed April 27, 2015 Affirmed Larkin, Judge Ramsey County District Court File No. 62-CR Lori Swanson, Attorney General, St. Paul, Minnesota; and John J. Choi, Ramsey County Attorney, Laura Rosenthal, Assistant County Attorney, St. Paul, Minnesota (for respondent) Cathryn Middlebrook, Chief Appellate Public Defender, Leslie J. Rosenberg, Assistant Public Defender, St. Paul, Minnesota (for appellant) Considered and decided by Larkin, Presiding Judge; Halbrooks, Judge; and Johnson, Judge. This opinion will be unpublished and may not be cited except as provided by Minn. Stat. 480A.08, subd. 3 (2010). This opinion will be unpublished and may not be cited except as provided by Minn. Stat. 480A.08, subd. 3 (2010). STATE OF MINNESOTA IN COURT OF APPEALS A10-2057 David Johnson, petitioner, Appellant, vs.
STATE OF MINNESOTA IN COURT OF APPEALS A10-1884. 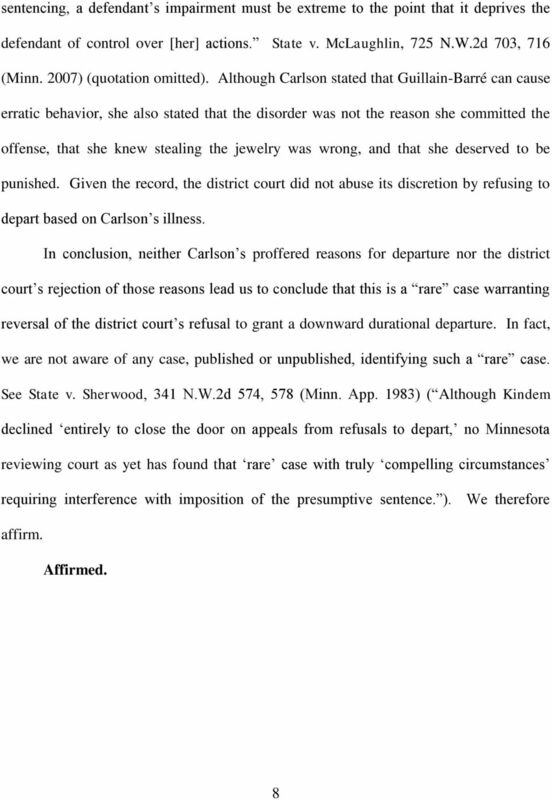 State of Minnesota, Respondent, vs. Jolene Kay Coleman, Appellant. STATE OF MINNESOTA IN COURT OF APPEALS A10-1884 State of Minnesota, Respondent, vs. Jolene Kay Coleman, Appellant. Filed January 3, 2012 Affirmed Kalitowski, Judge Hennepin County District Court File No. STATE OF MINNESOTA IN COURT OF APPEALS A14-1296. Shawn Michael O'Connell, petitioner, Appellant, vs. State of Minnesota, Respondent. This opinion will be unpublished and may not be cited except as provided by Minn. Stat. 480A.08, subd. 3 (2014). STATE OF MINNESOTA IN COURT OF APPEALS A15-0090 In re the Petition of: C.G.M. and C.A.M. NOT RECOMMENDED FOR PUBLICATION File Name: 15a0675n.06 No. 14-6537 UNITED STATES COURT OF APPEALS FOR THE SIXTH CIRCUIT UNITED STATES OF AMERICA, Plaintiff-Appellee, v. TERELL BUFORD, Defendant-Appellant. 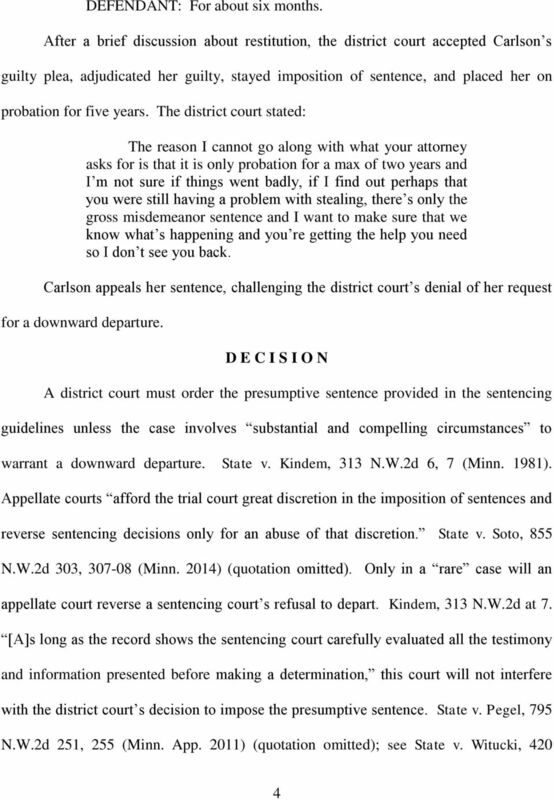 Illinois Official Reports Appellate Court People v. Bruun, 2015 IL App (2d) 130598 Appellate Court Caption THE PEOPLE OF THE STATE OF ILLINOIS, Plaintiff-Appellee, v. DAVID BRUUN, Defendant-Appellant. IN THE COURT OF CRIMINAL APPEALS OF TENNESSEE AT NASHVILLE Assigned on Briefs October 23, 2012 at Knoxville STATE OF TENNESSEE v. MISTY LYNN NANNEY Appeal from the Circuit Court for Montgomery County Nos. STATE OF MINNESOTA IN COURT OF APPEALS A10-1192. 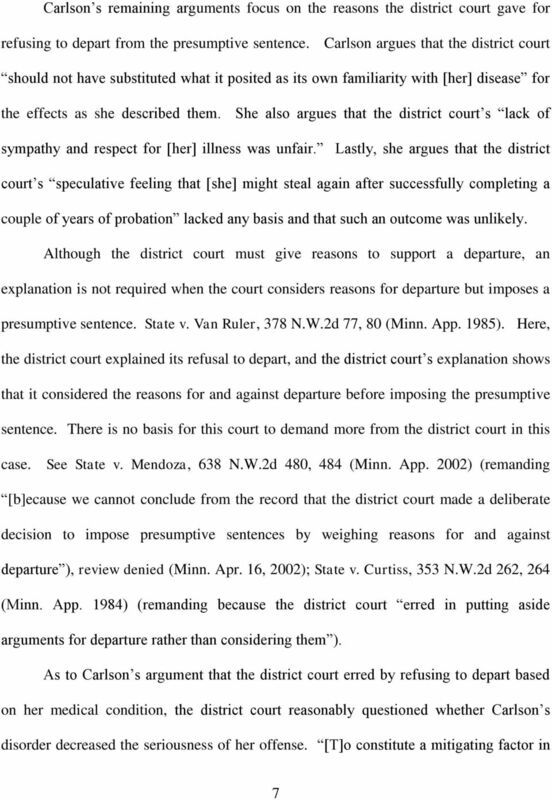 State of Minnesota, Respondent, vs. James Anthony Brown, Jr., Appellant. IN THE UNITED STATES COURT OF APPEALS FOR THE ELEVENTH CIRCUIT. No. 12-13381 Non-Argument Calendar. D.C. Docket No. 3:11-cr-00281-RBD-JBT-1. NOT FOR PUBLICATION WITHOUT THE APPROVAL OF THE APPELLATE DIVISION SUPERIOR COURT OF NEW JERSEY APPELLATE DIVISION DOCKET NO. 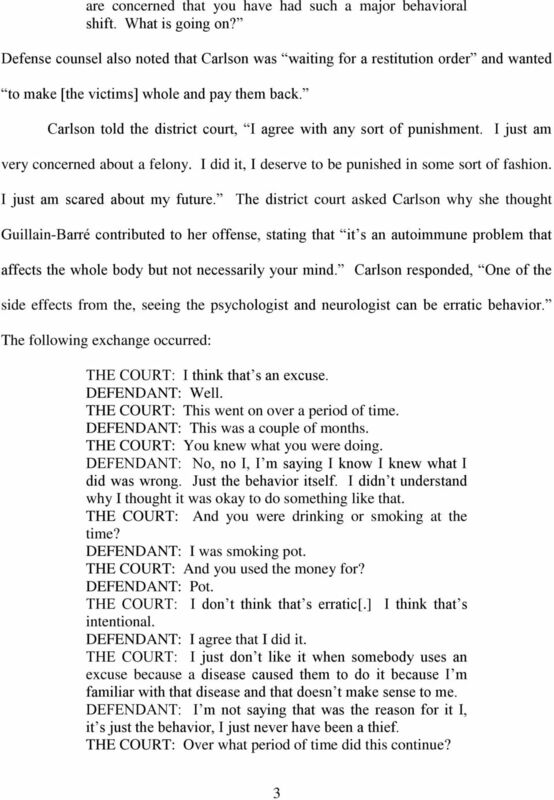 STATE OF NEW JERSEY, v. Plaintiff-Respondent, NINA ADEBAJO, Defendant-Appellant. NOT RECOMMENDED FOR FULL-TEXT PUBLICATION File Name: 15a0821n.06 No. 15-3121 UNITED STATES COURT OF APPEALS FOR THE SIXTH CIRCUIT UNITED STATES OF AMERICA, Plaintiff-Appellee, v. SHELDON W. HILL, Defendant-Appellant. IN THE COURT OF APPEALS OF IOWA. No. 14-0420 Filed May 20, 2015. Appeal from the Iowa District Court for Woodbury County, Jeffrey A. NOT DESIGNATED FOR PUBLICATION. No. 113,611 IN THE COURT OF APPEALS OF THE STATE OF KANSAS. STATE OF KANSAS, Appellee, KENDALL REX MOYER, Appellant.